Graduates are encouraged to invite family and friends to join them for this special service. Graduates should line up in Heaton Hall at Myers Park Baptist Church at 2:30 p.m. wearing their cap and gown. The Baccalaureate Ceremony is an interfaith service open to everyone from religious as well as non-religious traditions. 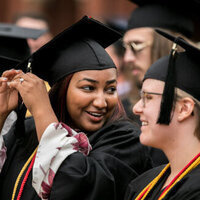 Traditionally, Queens invites a religious leader to offer a sermon to graduates and their families on the personal growth students have experienced during their time on campus and the challenges and opportunities they may encounter throughout their life. This year’s speaker is The Reverend Dr. Jerry L. Cannon, Pastor of C.N. Jenkins Memorial Presbyterian Church. Our Chorale will also offer inspirational music from various cultures and traditions. A reception will follow on Burwell Lawn. Myers Park Baptist is located directly across Selywn Avenue from Queens University of Charlotte.